The Smooth Sided Toad is also known as the Spotted Toad. These toads are brown, and unlike other toads, they are smooth-skinned. They may grow to seven inches in length. The pupils are horizontal. The parotoid glands (glands resembling warts, occurring behind the eyes or on the neck and shoulders) are usually conspicuous and may be large. The tympanum is clearly visible. The limbs are short and strong, the fingers free, and the toes more or less webbed. Males are smaller then females. The range of the smooth sided toad is northern South America. 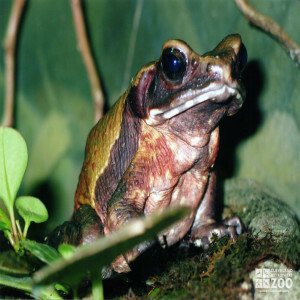 The habitat of the smooth sided toad includes lowland tropical and sub-tropical forests. Smooth sided toads may be crepuscular or nocturnal and are ground-dwellers. They generally hide during the day in deep leaf-litter, under rocks, logs or in burrows in tropical rainforests. Newly metamorphosed juveniles are usually active during the day. They are not strong jumpers. Reproduction of smooth sided toads is at the start of the rainy season in the tropics. They breed in temporary and permanent water bodies, some dug by the adults. Embryonic and larval development occur in water.